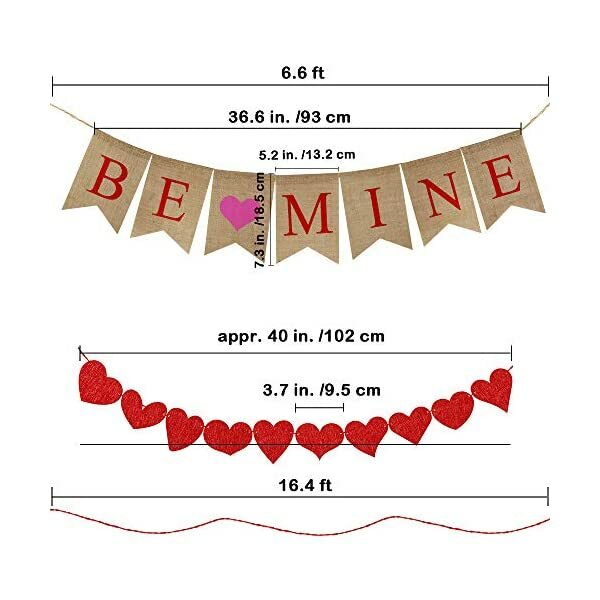 Quantity: Package includes 6.6′ Long BE MINE Letters and Heart Sign Valentine’s Day Burlap Banner BE MINE Bunting Banner (Rustic Jute Burlap Flag Bunting Banner), 20 pcs Red Felt Hearts in 10 shapes, 1 pcs Red Paper Raffia Cord. The BE MINE letters burlap banner is pre-assembled while the felt hearts and raffia cord come separately. Dimensions: Total length of the burlap banner: appr. 6.6 feet. Burlap pennants: 7.3″ x 5.2″ (LXW). Each flag is hung on jute twine and with plenty of extra twine on both sides for display. Felt hearts: 3.7″ in diameter. Paper raffia cord: 16.4 feet in length. 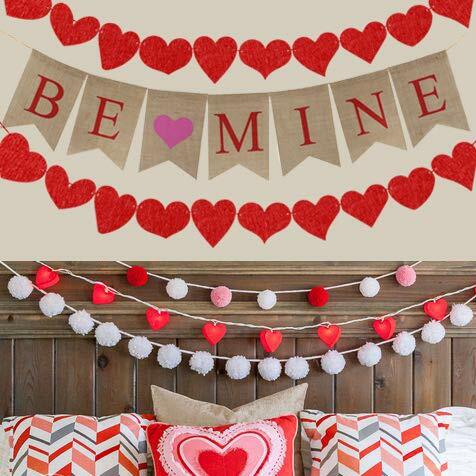 The hearts can be spaced any way you want along the cord. 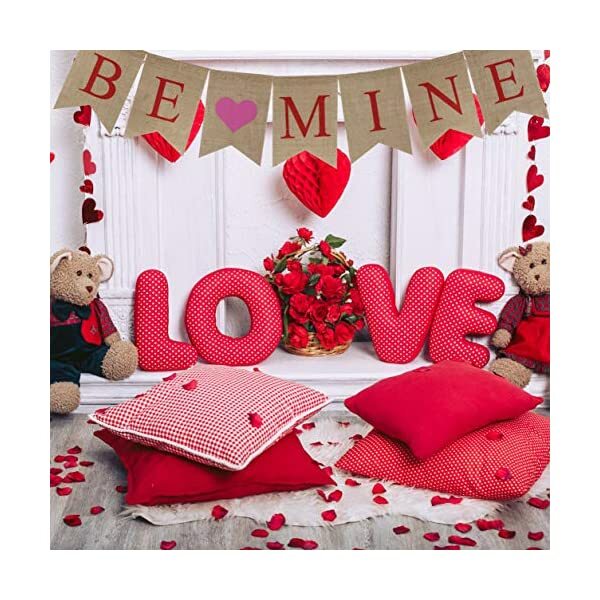 Color: The natural burlap pieces are clearly stenciled in red with the letters BE MINE and there is a pink heart to separate the words. It’s rustic and charming in every way. The felt hearts and raffia cord are red in color. 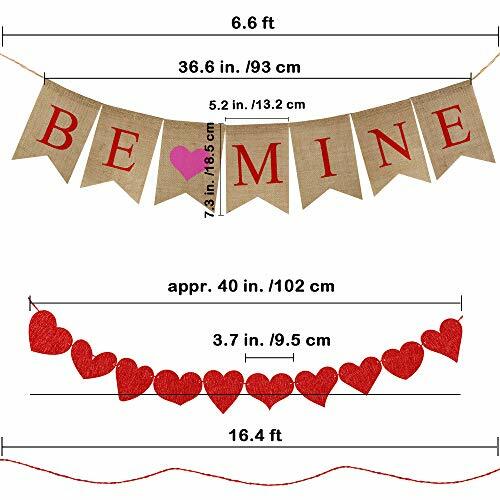 Package includes 6.6′ Long BE MINE Letters and Heart Sign Valentine’s Day Burlap Banner BE MINE Bunting Banner (Rustic Jute Burlap Flag Bunting Banner), 20 pcs Red Felt Hearts in 10 shapes, 1 pcs Red Paper Raffia Cord. 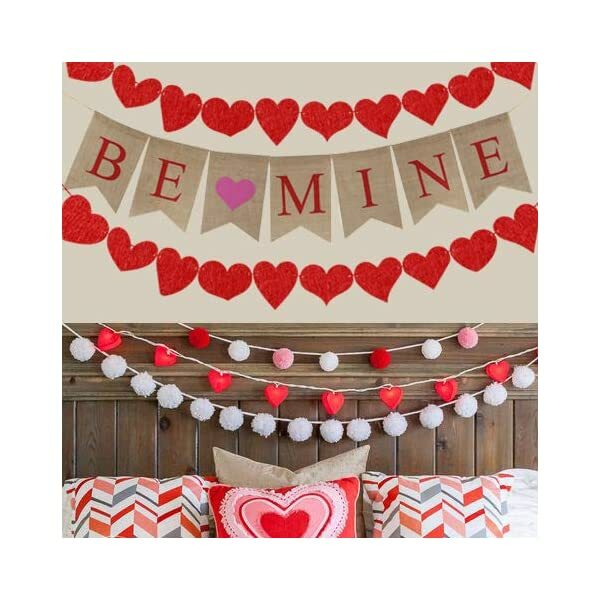 The BE MINE letters burlap banner is pre-assembled while the felt hearts and raffia cord come separately. Total length of the burlap banner: appr. 6.6 feet. Burlap pennants: 7.3″ x 5.2″ (LXW). Each flag is hung on jute twine and with plenty of extra twine on both sides for display. Felt hearts: 3.7″ in diameter. Paper raffia cord: 16.4 feet in length. The hearts can be spaced any way you want along the cord. Each flag is made from natural burlap then painted with premium acrylic paint. They are hand sewn at the tops for durability and easy movement. The hearts are made of thick felt. The banners are durable and will be able to reuse for many years. 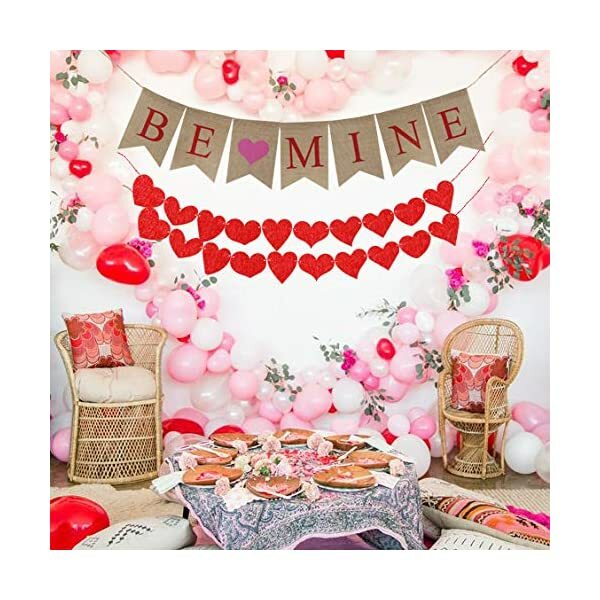 Display the BE MINE burlap banner and felt heart garland along your photo wall, on your mantel, fireplace, above the table, window … seriously anywhere you have a blank area this will fit wonderfully. 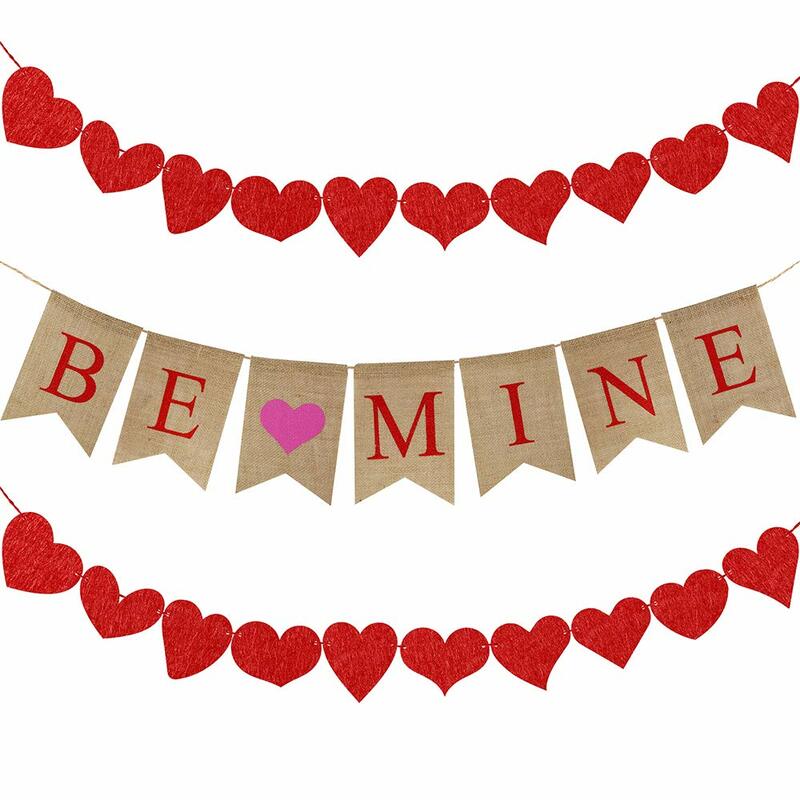 They are not only good for Valentine’s Day but also can be used for wedding, bridal showers and anniversaries! 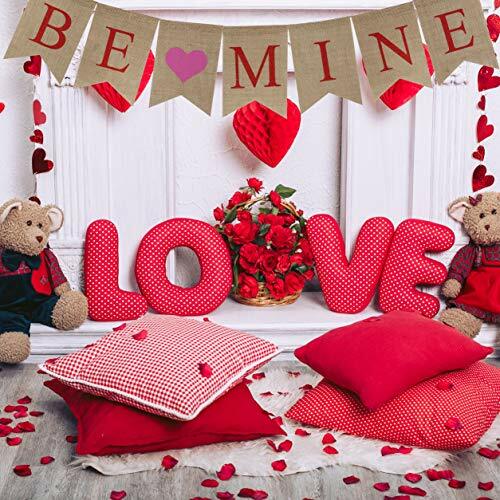 You can use the burlap banner and heart garland as decorations to living room, bedroom, mantel, fireplace, entryway, staircase, window or anywhere you want to hung around the house during the holiday season. 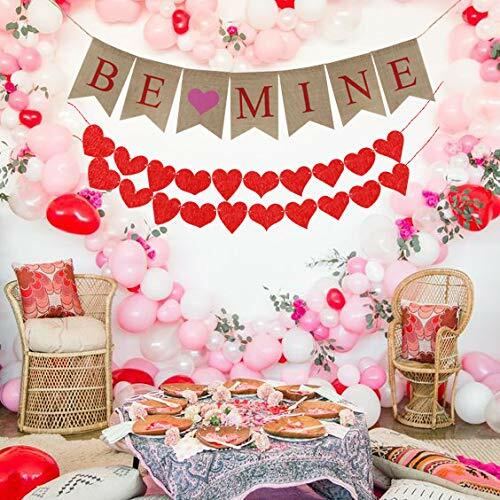 Perfect for using as photo props or decorations for Valentine’s Day, wedding, marriage proposal, engagement party or any other event that requires a romantic touch. Material: Each flag is made from natural burlap then painted with premium acrylic paint. They are hand sewn at the tops for durability and easy movement. The hearts are made of thick felt. The banners are durable and will be able to reuse for many years.